1. Disclose, Disclose, Disclose. Failure to disclose is perhaps the most common problem that sellers encounter. Whether it's intentional or not, failure to disclose will cause some major headaches in the future. Maintain a comprehensive list of all repairs (minor or major). Pay particular attention to issue involving water damage - even seemingly small problems. If areas such as wall cavities need to be inspected, prepare to do so long before you list the property (see #3 below). If you are in doubt whether you should disclose small concerns, don't hesitate... go ahead and disclose. Disclose everything and don't conceal anything. 2. Make All Necessary Repairs. Before you list the property, be sure to take prudent steps to repair all damage related to water intrusion and mold contamination. 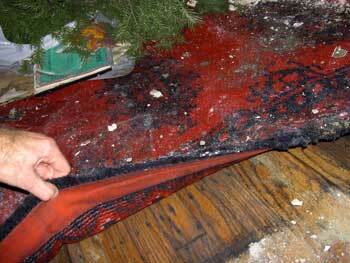 Now is not the time to cover up mold growth with bucket after bucket of paint. If you suspect a mold problem, hire a professional to investigate. If a major mold problem is discovered, be sure that professional becomes involved at an early stage. You don't want to run the risk of cross contaminating other areas of your home. Remember, a modest expense now can save thousands on the sale of your home or in litigation costs in the future. 3. Document. One of the advantages of paying the added expense of a professional mold investigation and abatement is that you now have sound documentation for future disclosure. You can demonstrate with confidence that you have taken the steps necessary to identify and repair all known concerns. Be sure your consultant and abatement contractor provide a detailed account of all work performed (and all important dates). 4. Educate and Cooperate. After hearing the countless nightmares of moldy home purchases, buyers are becoming much more knowledgeable on mold contamination and the risks it poses to their new home. As a seller, you too should become aware of your rights and liabilities. At the same time, respect the buyer's concern without giving into their every whim. If there is a justifiable reason to suspect microbial contamination, work with the sellers to resolve this issue. There are right ways to investigate and there are wrong ways to investigate. Consult with experts to determine your option. Meanwhile, maintain a positive and constructive dialogue between yourself and the prospective buyers - or the respective real estate agents. 5. Be Willing to Assume Partial Costs. If a legitimate unabated concern exists, either agree to repair the problem before the sale or be willing to assume partial cost for future repairs. Be sure to agree to limits - signing a blank check is an invitation to financial disaster, especially in litigation matters involving personal injury. The same holds true for areas that you know have been repaired but clearance testing demonstrates residual levels of contamination. Was the contamination removed or wasn't it? It may be impossible to tell with 100% certainty, but if a chance exists, agree to a fair amount for future testing and repairs should the problem resurface. Clearly, you will want an attorney to review all agreements prior to signing on the dotted line. 6. Perform a Mold Inspection Prior to Listing. The proactive seller will already have the results of a mold inspection in hand prior to listing. We only recommend this if the property has sustained prior water damage or mold contamination. Your proactive stance will be viewed as a good-faith gesture. Be sure to follow through by giving the sellers the opportunity to contact the consultant directly. As we mentioned above under "tips for buyers", mold inspections for real estate transactions differ from the "typical" mold investigation, namely because invasive inspections (wall or ceiling cavities) are rarely acceptable. Here are a few protocols that can be performed with minimal damage to the existing infrastructure: visual assessment of all accessible areas, photographic documentation, moisture assessments, sampling, and review of disclosure statements, maintenance records, and prior abatement or inspection protocols. The cost of performing a mold inspection will depend on the expertise involved and the type of work performed. Depending on the location, you can expect to pay between $500 and $1,200 for a mold inspection by a qualified expert. > Why does it grow in my house? Allergies and sickness due to indoor air quality, damage to wood-frame buildings by mildew, mold, staining fungi, and decay fungi is entirely preventable. The first step in prevention is inspection and testing.